Finland is a quite unknown bilingual country in Northern Europe. It became independent on December 6th after both Sweden and Russia had ruled over Finland. In terms of population it is one of the smallest nations in Europe. Only about 5,2 million inhabitants live in Finland and half million of them live in the capital, Helsinki. Other big cities are Espoo, Vantaa, Tampere and the former capital, Turku. In size Finland is the sixth biggest country in Europe with a surface area of 338,145 km2. Finland is usually known as "The land of a thousand lakes". The name is actually wrong, because the number of lakes in Finland is about 188,000. 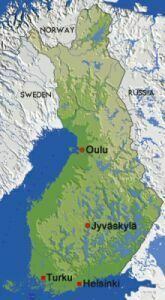 The biggest lake is Saimaa, 4400 km2, and it's the fifth largest in Europe. There are also a lot of forests besides lakes in Finland. About 70% of the land is covered with forest. Common trees are pines, spruces and birches. The Finnish nature in winter is almost similar to Northern Canada, so in winter there is lots of snow in Finland. Thanks to the Gulf Stream, it is warmer in Finland than in other countries on the same latitudes. In winter the temperature in Finland is between 0ºC...-30ºC and in summer it can be over +25ºC. The neighbouring countries of Finland are Sweden in the west, Norway in the north-west, Russia in the east and the smallest neighbour is Estonia in the south. Till February 2002 the official currency of Finland was the mark (FIM), but nowadays it is euro as in the main parts of Europe. During the 2nd World War in the 1940s, when Finland was at war with Russia, the majority of Finns earned their living from farming. But now most of Finnish people earn their living from service industries. Other important industries are machinery, metal products, forest-, chemical- and basic metal industry. But technology is maybe the most important industry in Finland. The biggest mobile phone producer in the world, Nokia, is a good example of Finnish knowledge. A very important part of Finnish every day life is sauna. Usually Finns go to sauna two or three times a week. In the 1900s it was usual to give birth in sauna, so the sauna was very important. Nowadays there are about two million saunas in Finland and that is quite much, because there are only about 5 million inhabitants in Finland. So that means almost every family has their own sauna. Even many of the block of flats have a sauna. There are different kinds of saunas. A smoke sauna, a Turkish bath and a traditional Finnish sauna. A traditional Finnish sauna is a wooden room, which is heated to 60-100ºC. A sauna can also be a separate building. The important part of a sauna is the stove, which has stones on it. The stove can be heated with either electricity or wood. The temperature and humidity are regulated by throwing water on the heated stones. People do not wear clothes in sauna, because it is so hot and you sweat. There is also often a separate washing and dressing room. 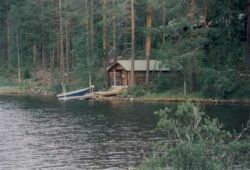 It's very popular for the sauna to be located at a lakeside. There you can also go swimming in the lake after being in the warm sauna. 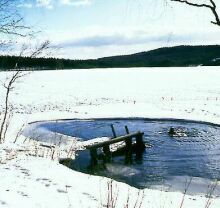 In winter Finns tend to do a hole in the ice and after sauna go swimming in the freezing water. They say that it will improve your circulation. In Finland they even organize the world championship of taking a sauna bath. In that competition the winner is the one who can stay the longest time in sauna, which is heated much over 100ºC. The meaning of sauna is that you will get clean and the most important thing is that you will feel fresh and relaxed. It is not exaggerated to say that Finns are crazy about sport. The most popular sports are cross-country skiing, ski jumping, motor racing, athletics and ice hockey. It doesn't mean that every Finn will go ski jumping every day. Usually people go in for ordinary sports like walking, cycling, badminton or jogging. Many famous athletes come from Finland. In Formula 1 there are a few well-known Finnish drivers like Mika Häkkinen, Mika Salo and Kimi Räikkönen. All of them are maybe the best F1-drivers in the world. Häkkinen has even won the world championship in Formula 1 twice. There also are successful Finns in rally. 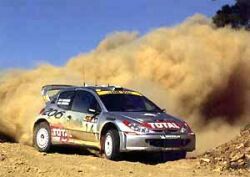 For example Tommi Mäkinen and Marcus Grönholm. Both of them have won the drivers' world championship and Mäkinen has even done it four times in a row. Besides motor racing Finns are succeeding very well in cross-country skiing, ski jumping, ice hockey and in many other winter sports. Finnish people tend to watch every single event on television, if there are any potential winners from Finland. The most popular event in TV in Finlad is perhaps ice hockey. Finns have their own ice hockey league (SM-league) and the Finnish ice hockey team won the world championship in Sweden in 1995. The day of sorrow for Finnish sport was the world championships in Lahti in February 2001. The Finnish cross-country ski team was caught using a forbidden drug, hemohes, and their results were cancelled and they got a one year suspension. No Finn would have believed that the best cross-country skier in Finland, Mika Myllylä, who won three gold medals in Ramsau in 1999, had used a forbidden drug in the games in his home country to achieve a gold medal. However, new great Finnish skiers are rising. But the most important thing in sport isn't winning but participation and having fun.